I know, I know. 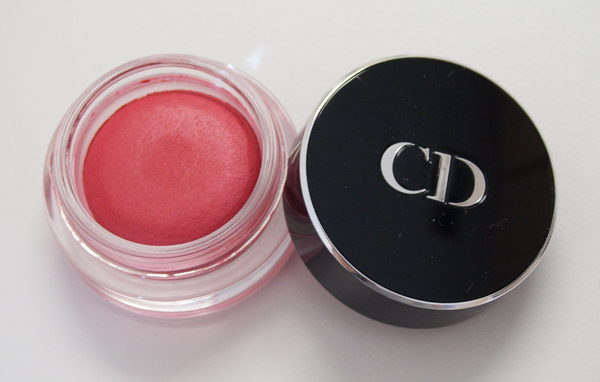 I am months late to the DiorBlush Cheek Crème party. I blame it on a moderate case of MME (Momentary Makeup Ennui) that I suffered from this summer. It was just too hot and I was too busy to be interested in any of the summer collections. But now that I am fully recovered, I am playing catch up! I recently ordered Bikini from Macys.com, which still has all four of the DiorBlushes and some of the Jelly Lip Pens for those of you who dropped the ball (as I did). Bikini is a cool-leaning hot pink. For some reason I expected it to be more of a pinky red, but it is beautiful nonetheless. Texture-wise, I was again surprised. Based on appearance alone, I expected the Cheek Crème to be somewhat spongey (a bit like the Chanel Illusion d'Ombres, I think). They aren't spongey, though. Rather, the texture is silky and they are nicely pigmented. I applied Bikini with a stippling brush, my prefered method, and the application was very smooth. It didn't apply patchy nor was it difficult to blend. The end result was a natural flush. The lasting power wasn't anywhere near as long as, say, the Josie Maran Coconut Watercolor Cheek Gelées, but it did stick around for about six hours on my oily skin. Given that it was an exceptionally humid day, as well, I'm not disappointed by the staying power. 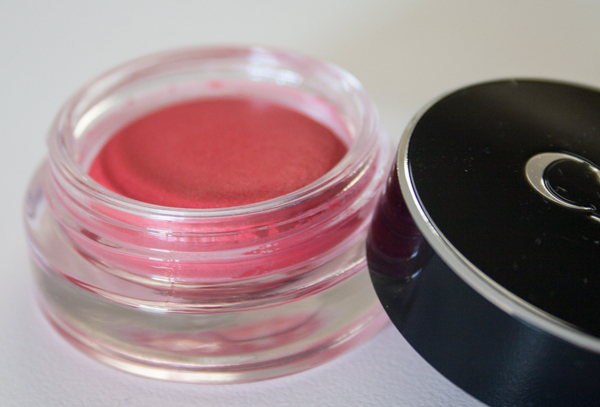 Plus, I feel that cream blushes are particularly suited to mid-day brushless touchups! 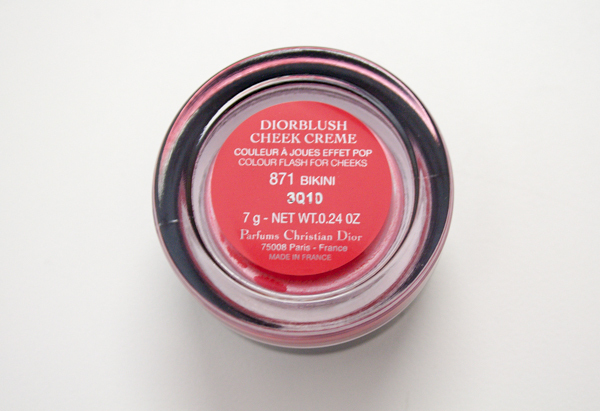 I really like the look of the DiorBlush Cheek Crème in Panama, as well, so I might order that off of Izzysbeautyshoppe.com (I've ordered from them before and I've always been satisfied) if they sell out on Macys.com. 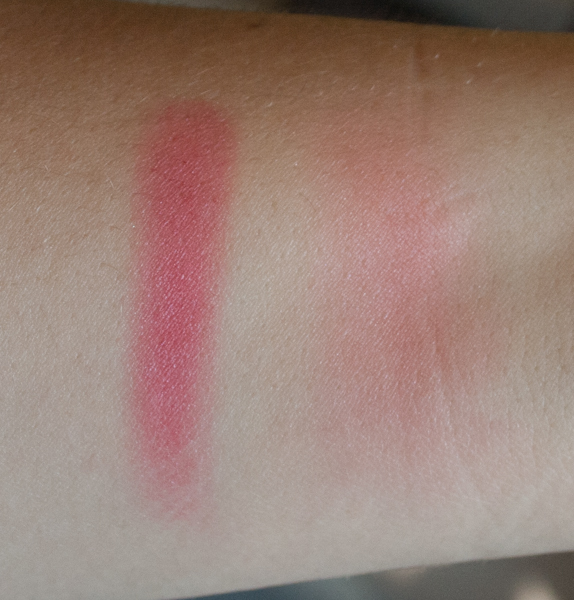 Overall, I don't love the DiorBlush as much as the Josie Maran (I've gotten onto a bit of a dewy cream blush kick and have ordered one by Canmake, Le Métier de Beauté in Ginger Lily, and I'm looking at the cream lip & cheek tints by RMS). But, Bikini is lovely--it ha a beautiful color and a smooth finish, and it applies easily. 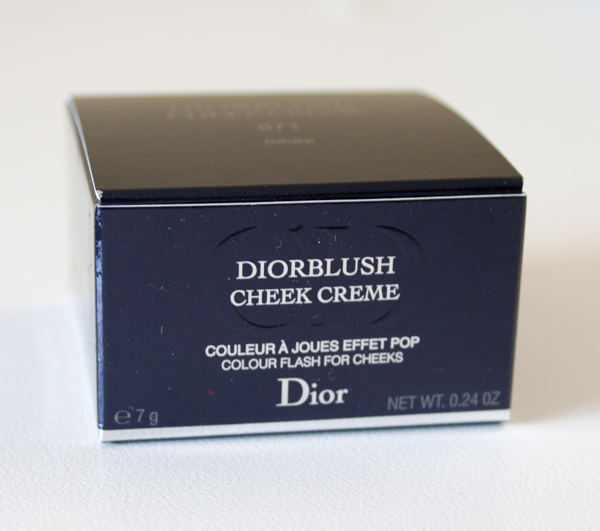 Did you guys pick up a DiorBlush Cheek Crème this summer, or did you skip this collection? Ok!!! I'll check out the JM next time I go to Sephora :-) Yes, where does all the makeup go??? ?